Web design is getting increasingly complex. It hasn't ever been easy, but there was a time when if your website worked on the dominant web browser you were pretty much home free. Unfortunately for us, the days of the dominant browser controlling 90% of the market are long gone. 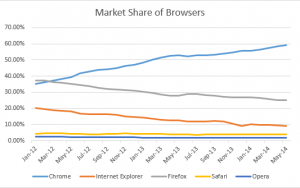 Chrome is over 70% and growing according to some statistics, but Firefox is holding steady at about 15% with IE & Safari battling for the left overs. In the increasingly bloody battle for market share, the days of semi-annual release schedules are also behind us. Chrome and Firefox jostle for best, fastest, coolest release of the moment and new browser versions come out monthly. While many people have their browsers update in the background automatically (Recommended Settings by the browser lords of course) a significant number of people still update on their own schedule or follow corporate policies. On top of all this, we also have the shift to mobile and responsive web design. Most of our customers are now seeing 50%+ of traffic coming on tablets and smartphones. These mobile devices also have operating system and browser differences that affect how their users see your site. No one can afford to test their site and ensure it looks good and works well on ALL devices that are out there and that would make no sense anyway. Our policy is to test on operating systems, browser and devices that make up at least 5% of the visitor sessions we are seeing across a group of our top clients that have different target audiences. This is actually a fairly broad spectrum and saves our customers from the time and expense of testing for uncle Jim's Blackberry Bold. This real world data is updated quarterly based on the data from the last month of the previous quarter. Our focus is of course on the future so the best results are in the newest browsers but we promise that our clients sites will work in the older browsers. It might look slightly different, but the stragglers will be looked after and will be able to get the information they want, and contact you or make a purchase.